PORT CANAVERAL, Fla. (NNS) — USS Indiana, the third submarine to bear the name and third vessel to be named for the state, was brought to life by its sponsor, Diane K. Donald, wife of retired Adm. Kirkland Donald, the former director of Naval Nuclear Propulsion and commander, Submarine Forces, Sept. 29, 2018. Before giving the order to bring the ship to life, Indiana’s sponsor had a few words to impart to those in attendance and any potential future adversaries. Indiana is a part of the Virginia-class’ third, or Block III, contract, in which the Navy redesigned approximately 20 percent of the boat to reduce acquisition costs. Indiana features a redesigned bow, which replaces 12 individual Vertical Launch System (VLS) tubes with two large-diameter Virginia Payload Tubes (VPTs) each capable of launching six Tomahawk cruise missiles, among other design changes that reduced the submarines’ acquisition cost while maintaining their outstanding warfighting capabilities. While the crew of the submarine may only be 140, Indiana Governor Eric J. Holcomb indicated that the “whole” crew may not fit on board. After the ceremony, Indiana was opened up for tours to the general public, to include the crew’s mess, the wardroom, control, and the torpedo room. It is there perhaps that the words of the Director of Naval Reactors, Adm. J. Franklin Caldwell, Jr. stuck home to the thousands who wouldn’t normally step foot inside a nuclear-powered submarine. 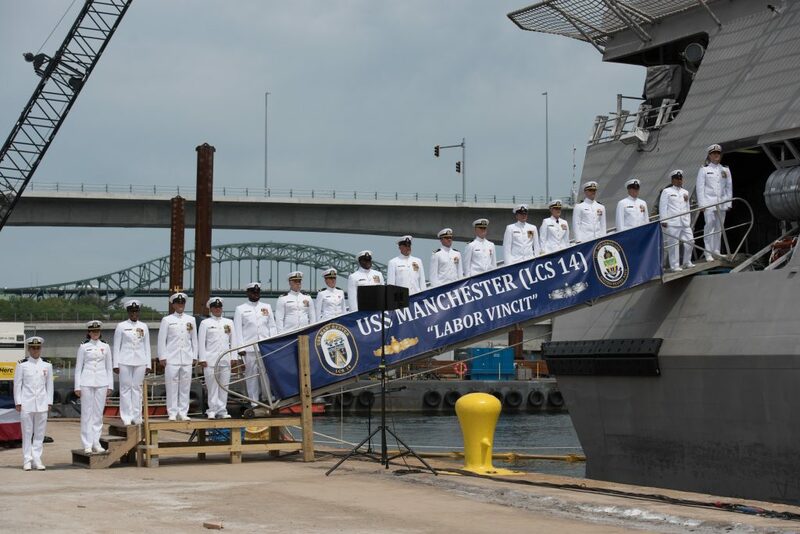 The littoral combat ship USS Manchester (LCS 14) was commissioned as the Navy’s newest surface combatant in a ceremony in Portsmouth, New Hampshire, May 26. The U.S. Navy’s newest littoral combat ship was christened over the weekend in a ceremony in Mobile, Ala. The USS Cincinnati, an Independence-class littoral combat ship, becomes the 11th ship built by Austal USA as part of the LCS program. Cincinnati councilman and former member of the U.S. Congress, David Mann, spoke at the christening, and former Secretary of Commerce Penny Pritzker served as the ship’s sponsor. 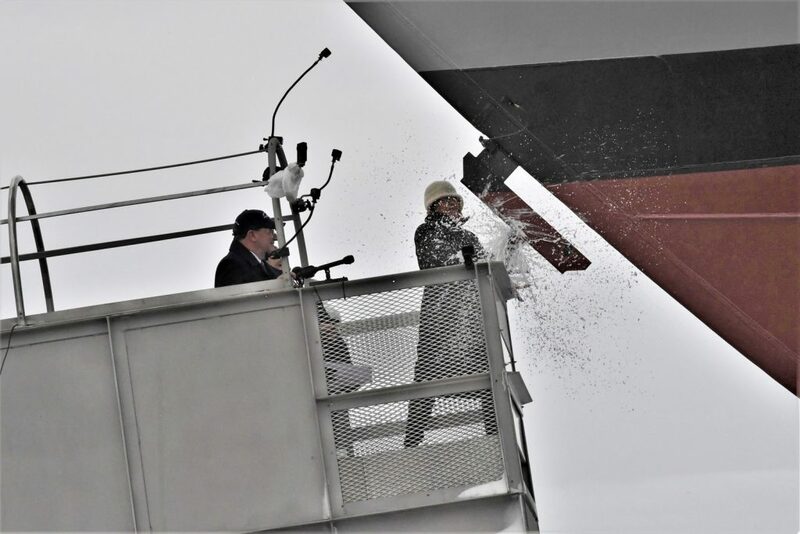 Pritzker broke a bottle of sparkling wine across the bow in keeping with time-honored Navy traditions. “The future USS Cincinnati is a symbol of the strong connection between the people of Cincinnati and the Navy and Marine Corps team,” Secretary of the Navy Richard V. Spencer said in a press release. “The ship serves as a testament to our commitment to growing the Fleet and our partnership with industry and the American public,” said Spencer. The Independence-variant littoral combat ship is a high-speed, shallow draft, surface warfare ship designed to conduct anti-submarine warfare and mine countermeasure missions. The U.S. Navy has contracted Austal USA to build 15 littoral combat ship worth a combined cumulative value of more than $4.5 billion. PORTLAND, Ore. — As medals adorning their chests clang with each running step, Sailors rush past the brow to man their vessel. 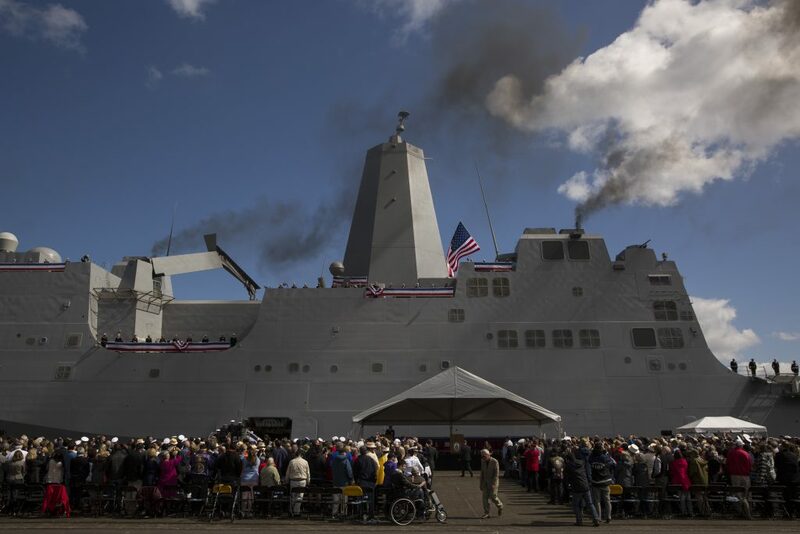 During an official commissioning ceremony held in front of over 5,000 guests, the crew of the USS Portland (LPD 27) brought their ship to life in Portland, Oregon, April 21. While addressing the audience, Shanahan emphasized the importance behind the naming of the Portland, while touching upon the history of the first two ships to carry the name ‘Portland’. Upon conclusion of the ceremony, guests were invited to tour the 684-foot war fighting vessel, where they could experience the state of the art design that will continue to sail decades from today with future generations of Sailors and Marines aboard. “Portland’s motto, ‘First Responders, Brave and Determined’ made having the ceremony in Portland — with the city’s first responders present — even more meaningful for all in attendance,” said Hill. Today, Portland boasts a heavy arsenal of capabilities beneath the hood. Amphibious transport dock ships are versatile players in maritime security with the ability to support a variety of amphibious assault, special operations or expeditionary warfare missions, operating independently or as part of Amphibious Readiness Group (ARGs), Expeditionary Strike Groups (ESGs), or Joint Task Forces (JTFs). In addition to performing their primary mission, the San Antonio-class ships support anti-piracy operations, provide humanitarian assistance, and foreign disaster relief operations around the world. 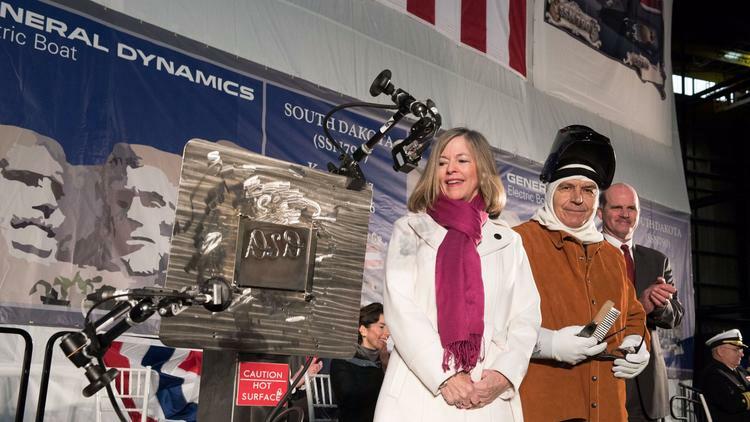 The Lockheed Martin-led industry team hosted the christening ceremony for the 17th Littoral Combat Ship (LCS) at the Fincantieri Marinette Marine shipyard today. 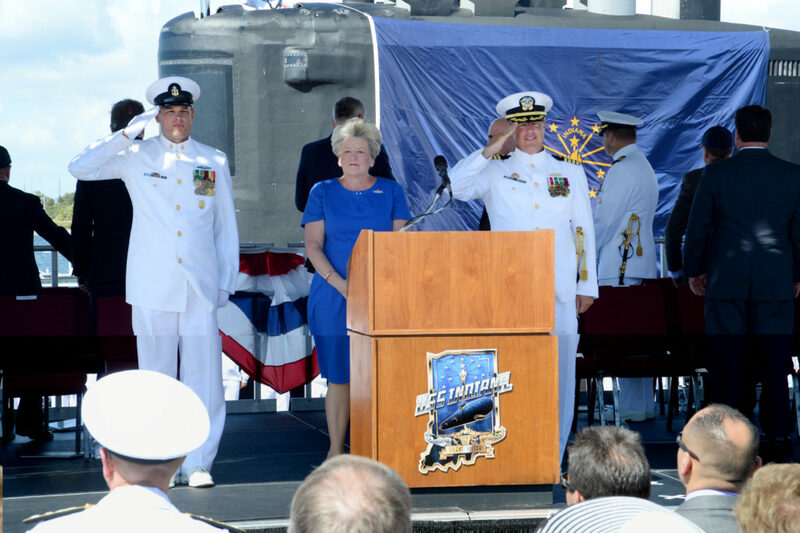 Ship sponsor Jill Donnelly christened LCS 17, the future USS Indianapolis, in Navy tradition by breaking a champagne bottle across the ship’s bow. The future USS Indianapolis is named in honor of the incredibly brave men and women in uniform who have served our country for generations and who continue to serve today. LCS 17 will be the fourth U.S. Navy ship to bear the Indianapolis name. She will undergo additional outfitting and testing at Fincantieri Marinette Marine before her anticipated delivery next year. The Lockheed Martin-led industry team is currently in full-rate production of the Freedom-variant of the LCS, and has delivered five ships to the U.S. Navy to date. The future USS Indianapolis is one of eight ships in various stages of construction at Fincantieri Marinette Marine, with one more in long-lead production. The Lockheed Martin-led LCS team is comprised of shipbuilder Fincantieri Marinette Marine, naval architect Gibbs & Cox, and more than 800 suppliers in 42 states. The LCS is the Navy’s most affordable surface combatant shipbuilding program. 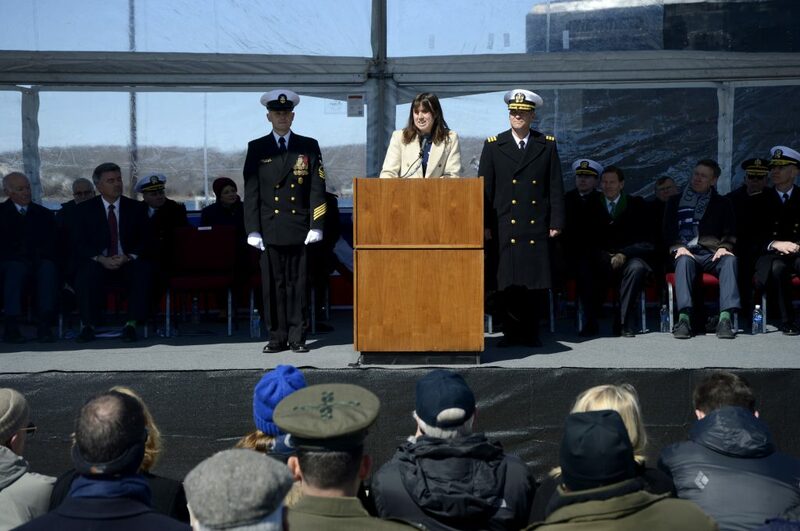 GROTON, Conn. (NNS) — Colorado is the first submarine to bear the name and third vessel to be named for the state and was brought to life by her sponsor, Annie Maybus Mabus, daughter of the 75th Secretary of the Navy Ray Mabus. Colorado is a flexible, multi-mission platform designed to carry out the seven core competencies of the submarine force: anti-submarine warfare, anti-surface warfare, delivery of Special Operations Forces (SOF), strike warfare, irregular warfare, intelligence, surveillance and reconnaissance and mine warfare. Also, in Virginia-class SSNs, traditional periscopes have been replaced by two photonics masts that host visible and infrared digital cameras atop telescoping arms, which are maneuvered by a Xbox controller. Through the extensive use of modular construction, open architecture, and commercial off-the-shelf components, the Virginia-class is designed to remain at the cutting edge for its entire operational life through the rapid introduction of new systems and payloads. “I couldn’t be more proud and honored to serve with and for the crew,” said Koepp. “The Colorado is a gem of an assignment for any submariner, whether you are a first-term, junior Sailor or you are the commanding officer. I couldn’t be more proud to lead and serve with the crew. U.S. Sen. Tim Scott stood atop the deck of the massive gray warship docked in Charleston Harbor on Saturday morning and asked members of the crowd to transport themselves back to 1968 — a time of social strife amid the civil rights movement. Out of that period and out of Charleston, a city with its own history of racial issues, comes a singular story: that of Pfc. Ralph Johnson, a Marine who was killed in Vietnam after jumping on a grenade that landed in his fighting hole, Scott said. His actions cost him his life but saved two fellow Marines and earned him the Medal of Honor, the nation’s highest military decoration. “Ralph began a legacy that should last through eternity,” he said. Scott, R-S.C., was among several speakers at a commissioning ceremony for the USS Ralph Johnson, the Navy’s newest destroyer. A crowd of about 6,000 gathered to watch as the ship officially came on duty for the first time. During the ceremony, many spoke about Johnson’s sacrifice and the legacy that the 19-year-old left after he dove belly-first onto the grenade and shouted a warning to others. “I am proud to serve a city that could produce such an extraordinary man,” Charleston Mayor John Tecklenburg told the crowd. Helen Richards, Johnson’s sister, said she and her family are honored to have the ship named after their relative and said two of his grandnieces and a niece are currently serving active duty in the military. Another niece retired from the Air Force. 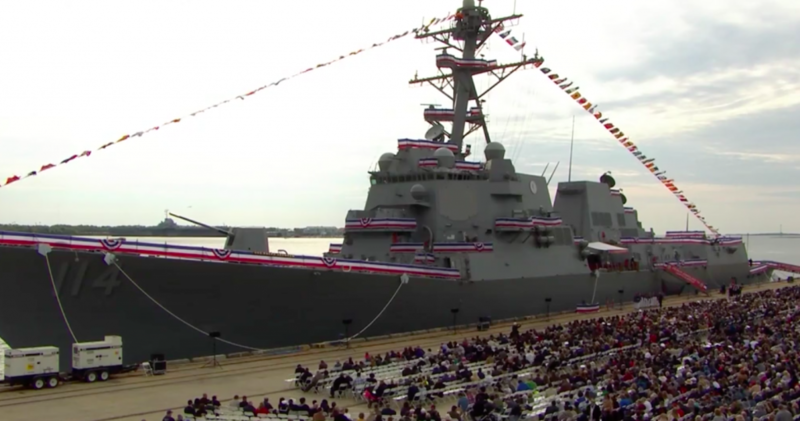 The 509-foot warship is the Navy’s 64th Arleigh Burke-class destroyer. It carries two helicopters, missiles, torpedoes and up to 338 crew members. Its top speed is 35 mph. Gen. Robert Neller, Marine Corps commandant, spoke about the ship’s capabilities and how it will carry on the spirit of bravery exemplified by Johnson. 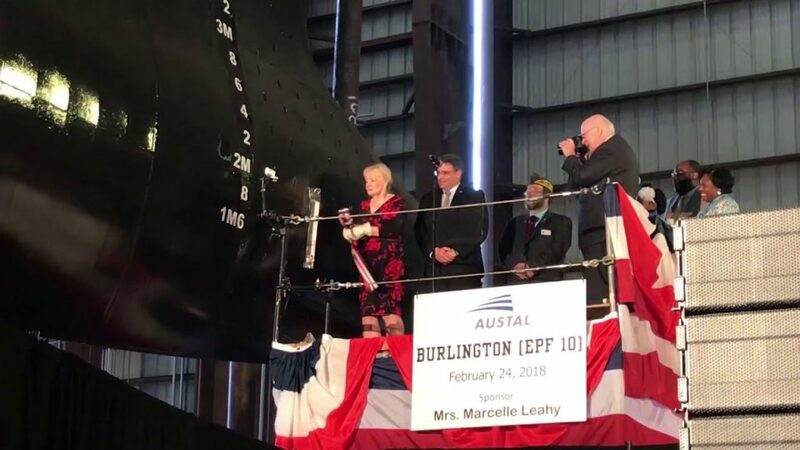 Marcelle Leahy breaks a bottle over the newest ship named for the largest city in Vermont. She’s the ship’s sponsor and the wife of longtime Democratic Senator Patrick Leahy. Senator Leahy says he’s proud of the new ship. “We spend a lot on our military and we want them prepared for the threats of today not from yesterday and this gives us a lot of flexibility it can also be a vessel in rescue operations,” said Senator Leahy. Austal is contracted to build at least two more EPFs. Friday President Trump also had a special announcement for Austal in Mobile. Friday Trump announced the name of the latest LCS. The USS Canberra, which will eventually be built in Mobile, is named after Australia’s capital city.